EU Ambassador to Seoul Tomasz Kozlowski (right) poses with Chairman Lee Ju-Tae of the Korea Importers Association (KOIMA) at KOIMA CEO Academy forum held at a Seoul hotel Sept. 8, 2011. Chairman Lee Ju-Tae of the Korea Importers Association (KOIMA) invited EU Ambassador to Seoul Tomasz Kozlowski and Administrator Kim Dong-Sun of Small & Medium Business Administration (SMBA) to a breakfast forum "KOIMA's CEO Academy" held at Palace Hotel in Seoul on Sept. 8, 2011. The EU envoy delivered a lecture under the title of “The EU-Korea FTA and Its impact on EU-Korea Trade Relations” in front of some 100 businesspeople gathered in the Grand Ballroom of the hotel. He expected that most of the lingering tariffs and other trade barriers will be removed or lifted gradually in the years ahead, boosting the ties of the two trade partners to the level of strategic one. 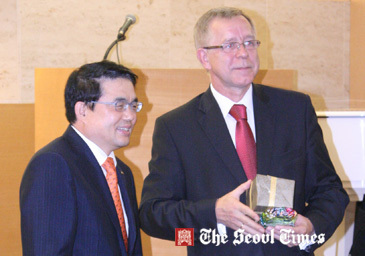 The Polish diplomat hoped that the bilateral trade relations between EU and South Korea would grow into strategic ties. The EU envoy coined the EU ties with South Korea as “strategic partner” the same as EU relations with the US, China, Russia, India, and South Africa. 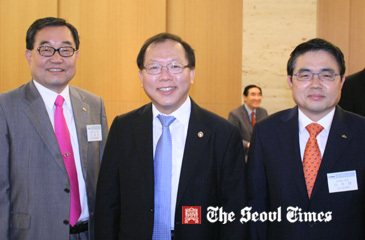 Administrator Kim Dong-Sun (center)of Small & Medium Business Administration (SMBA)poses with KOIMA Chairman Lee Ju-Tae (right) and KOIMA Executive Vice Chairman Ko Kwang-Sok. Administrator Kim emphasized the importance of forming cooperative network between major companies and small- and medium-sized companies. He also stressed the division of labor between the large conglomerate and smaller companies in their role for cooperative partnership. “I believe that the outer expansion of our trade volume has been largely successful, compared with our neighboring countries” he said. Mr. Kim has been visiting a dozen of countries including the US, Japan, China, Russia, Indonesia, Vietnam, UAE, Israel, and Turkey since he was inaugurated as the SMBA administrator in March 2010. He also mention about the future trend of business relations between China, Korea, and Japan.